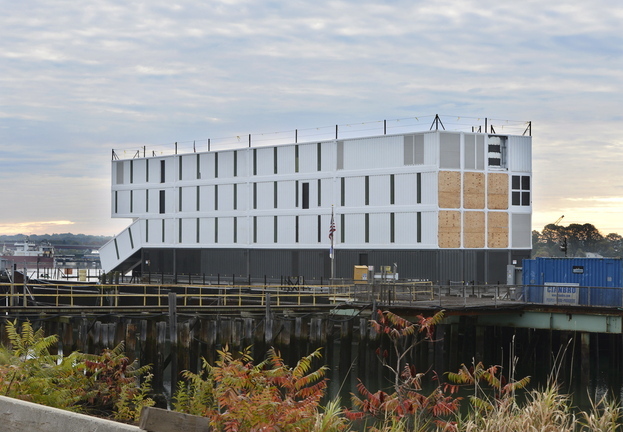 Could it be housing for sailors, a government facility or a Google floating data center? ‘This is a good thing for Maine,’ Cianbro’s CEO promises. What’s inside the four-story structure that was towed into Portland Harbor on Oct. 11 and how it will eventually be used remain a mystery, but some clues have emerged. The structure itself isn’t hidden away. It’s still on the barge that hauled it into Portland, docked at the Rickers Wharf Marine Facility, where Cianbro Corp. is scheduled to do a significant amount of interior work on it, including the installation of undisclosed technological equipment. Even workers on the project aren’t being told about the structure’s purpose or the identity of its owner. That’s known by only a few Cianbro executives, said Peter Vigue, chairman and CEO of Cianbro. The company has signed a nondisclosure agreement with its customer, which has made secrecy a priority, he said. “We are absolutely forbidden to discuss it in any way or in any detail,” Vigue said. The Coast Guard doesn’t know what it is, said a staffer at the base in South Portland. The Portland Harbor Commission hasn’t been told, either. So far, no one has figured it out, said Tom Dobbins, chairman of the commission. The structure’s exterior was built in New London, Conn. Its final destination could be anywhere the barge can carry it. That rules out a voyage across the ocean, but leaves the coasts of North and South America and all navigable inland waterways. Some have speculated that the structure is related to Exxon’s $14 billion project to develop the Hebron oil fields off Newfoundland. Not so, say Exxon officials, who were shown photographs of the mystery structure and denied any involvement. Others have speculated that it is a floating hotel for people building oil rigs in the Gulf of Mexico. The top three floors appear to be divided into 196 rooms – with no windows. The customer could be the U.S. military or the Department of Homeland Security, which would explain the secrecy, said Jeff Monroe, Portland’s former port director, who now works as a transportation consultant. “In the name of security, the government can do a lot of things and keep them quiet,” Monroe said. He said the structure could be a power plant or perhaps a “barracks barge,” providing housing for sailors before they are assigned to their ships. OK. Here’s one project that would be good for Maine, but not actually in Maine: In 2009, the search engine giant Google received a patent for a proposed floating data center that uses the ocean to provide power and cooling. According to Google’s patent application, a fleet of data centers would float three to seven miles offshore in water 165 to 230 feet deep. They would use ocean water for cooling and wave-energy machines to create electricity. Anchored off the coast of Maine, Google wouldn’t have to buy any land or pay property taxes. Google could not be reached late Tuesday to discuss that theory. Of course, thanks to technology like Google Earth, it’s harder to keep a secret these days. After Cianbro finishes its work, the barge will leave Portland Harbor and the public will be able to follow its journey on commercial websites that use global positioning system data, said Dobbins, of the harbor commission. He said the structure’s owner will try to keep the secret as long as possible, but eventually the truth will emerge when the vessel reaches its destination. “Who knows where it ends up?” he said.